We woke this morning to find the lines in a bit of a tangle around the buoy. My marvellous idea of putting a second line through the eye on the buoy rather than the one on the pennant (in case the pennant parted company with the buoy) was good in theory, but didn’t take into account the fact that our lines do not float. With little wind to keep the line stretched out during the night, we had drifted round and around the buoy and with each turn our rope, which was hanging limply in the water, had wrapped itself around the line BENEATH the buoy. Steve had been debating whether to have an early morning snorkel, and this made his mind up for him as he had to go into the water to undo the tangle. It didn’t take long to sort out though, and we were very soon under way towards Carriacou with a reef in the main and the yankee. We hugged the coast of Grenada right around to Sauteurs on the north coast before changing tack and heading towards Isle de Ronde, to the East of Kick’em Jenny. With the wind at 10-15 knots from just south of east we made Tyrell Bay on Carriacou on one tack, sailing right into the bay. It was a great sail mainly close-hauled until we bore away at Isle de Ronde onto a close reach to sail between the Sisters rocks. 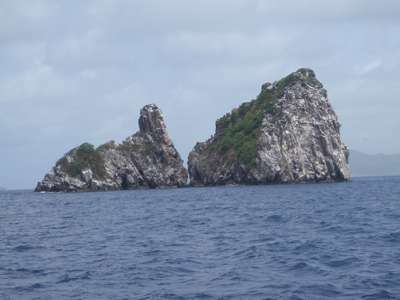 Sailing between the Sisters rocks. By mid-afternoon the anchor was down in Tyrell Bay, and we took the rib ashore for a wander around. We found a beachside bar and stopped for a rest and refreshments overlooking the bay. 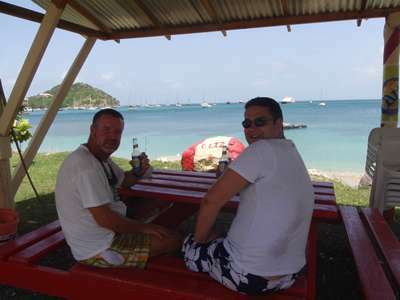 Looking out over Tyrell Bay, Carriacou. Steve had phoned the dive shop as soon as we arrived, only to find that they had just hauled their boat out for the weekend thinking they had no customers. Typical timing for us! No diving tomorrow then, so we decided to go to Petite Martinique instead.